Rooms are available to hire in our new purpose built Alexander Technique centre. 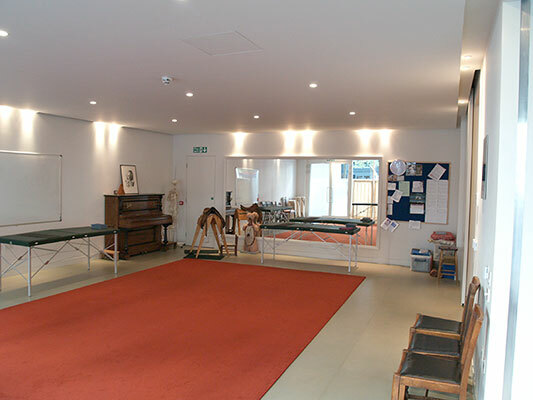 Although predominantly for teaching the Alexander Technique, the three rooms are very versatile and other uses can be accommodated. The large room would be suitable for group classes of up to 45 people and the two smaller rooms for one-to-one work. The large and the medium size rooms can be combined. All three rooms have natural light and access to fresh air, wooden floors with underfloor heating and are all on the ground floor with doors that can be opened onto the Boulevard. There is a large reception area with coat storage, desk space, free Wi-Fi and a kitchenette designed for quick tea breaks. There is step free access and disable facilities. The rooms are available for hire from 8.00 am to 9.30 pm for 7 days per week and 365 days per year. Prices vary by room, day, time and number of people. To find out more please contact us. For more details please see roomhirefulham.com.